Death/Black Metallers HATE from Poland ready to enter the studio! Polish Death Metal squadron HATE is preparing to head to the studio in December to record the follow-up to 2017′s “Tremendum.” The new opus, bearing the working title “Salve Ignis,” is tentatively slated for summer 2019 and will be the band’s debut collaboration with the legendary Metal Blade Records. Details are still surfacing, but the band has so far released two raw pre-production tracks: “Path to Arkhen” and “In The Shrine Of Veles”, and have confirmed that production on the finished record will be handled by the talented Wieslawski brothers at Hertz Studio, Poland (Behemoth, Vader, Decapitated, and others). More info shortly! HATE have been praised by press and fans alike for years for creating lacerating and dark music, proven best on their current album ‘Tremendum‘ (2017). 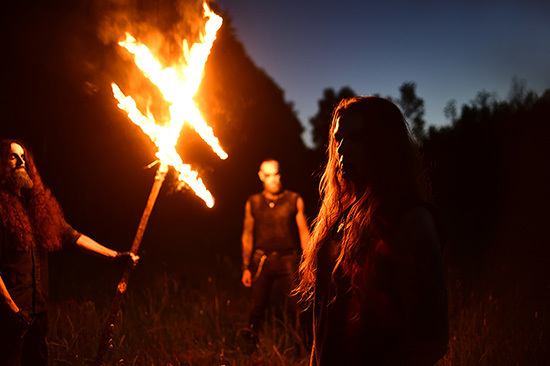 The album saw ATF Sinner (vocals, guitars) utilize the dark aspects of the mystic and arcane Slavonic folklore to explore themes both personal and impersonal. It is an album that is relatable at first listen, but that is hard to fully know.